The Middle Ages are commonly divided in three epochs: The Early Middle Ages, the High Middle Ages and the Late Middle Ages. In this article you will learn the general political and religious beliefs during the Medieval Times as well as the causes that led to the beginning and end of the period. From the 3rd century onwards, large tribal groups consisting mainly of Huns, Magyars, Bulgars, Avars, and Slavs slowly incorporated into Roman territory. At first the Romans gave them land in exchange of peace. However, during the 4th century, many of these tribes became more hostile toward the Romans and began to pillage important Roman settlements. Some landholders accepted their new lords while others remained independent fighting for the Empire. The Roman laws and customs were adopted by most of the tribes. An important example is the Franks who invaded Gaul and aspired to the Roman ways of life. They adopted their customs and gradually polished the language we know today as French. In the early 4th century most Roman legions in Gaul and Spain left to defend Rome - however, the constant Hunnic raids seriously devastated the Roman Empire. The Huns reached as far as Paris and Orleans led by Attila the Hun, though they were finally defeated by general Aetius. Despite a succession of weak emperors, numerous plagues, natural disasters, rebellions, economical instability and a general lack of union in the empire, Rome was hardly about to collapse. What truly destroyed the Western Roman Empire and changed the course of history was the barbarians. Despite some Roman military success, the Goths, whom the Romans had allowed into their land, crossed the Danube on September 4, 476 successfully deposing the last Western Roman emperor: Romulus Augustus. This event has been traditionally seen as heralding the end of the ancient world and the beginning of the Middle Ages. The breakdown of Roman society led to many problems. It became unsafe to travel or trade goods over any long distance and therefore, most newly-conquered settlements faced many economical problems. Within a generation, illiteracy rose incredibly in the West as most Roman schools and libraries ceased to function. The Christian Church was the only real centralized institution that survived the fall of the Empire mostly intact. Bishops, who still studied and knew how to write properly, became more important in this newly-created society. This led to a very powerful church that was not as devoted to religion as it was to politics. The Ostrogoths settled in Italy and Southern Gaul, the Visigoths in Spain and Portugal, The Saxons in England and the Burgundians and Franks in Gaul and western Germany. These became kingdoms with the Catholic Church as their official religion. Until the 8th century, the new system was incapable to support the infrastructure required for public baths, education facilities and entertainment - mainly because of bad tax coverage and excessive corruption. Beginning in the 8th century, the medieval economy slowly improved. For the first time in four hundred years there was hope of improvement. Kingdoms were beginning to take form causing law and order to improve notoriously. With the ever-growing threats mainly from the Viking raids and the numerous warlike tribes that had recently settled in the West, Feudalism gradually developed. The concept was simple: Knights protected landlords in exchange of fief (land). At first during the Early Middle Ages, the system was very flawed as knights could easily change allegiance or not fight at all. However this system allowed peasants to work freely. The first real armies emerged in Europe since the Romans during this period. To the East, Islam became a very powerful religion which eventually invaded Spain and seriously threatened the Franks and most of Europe. However, a great leader and military genius stopped their progression. He is also credited for creating the first standing army of the West since the Roman Empire and for being able to defeat stronger opponents with more numbers and better weaponry - he was Charles Martel. At Tours, he won his greatest victory and successfully put Europe out of risk of a total Muslim invasion. Many credit him as "the savior of Christianity" and even though he was almost excommunicated years before, the church itself publicly recognized him as its savior. Martel's son, Pippin the Younger or Pippin the Short, was the first Carolingian king in 751. He expanded Frankish borders but still was not a very important figure. His son, Martel's grandson, Charlemagne was a much more prominent person. Charlemagne was crowned emperor in Rome on Christmas day, 800. His rule united most of modern France, Northern Italy and Western Germany. However, that unity didn't last long. For 200 years after Charlemagne's death, the West and East were in conflict - both seeking more power. One of the main events that historians consider to have set the High Middle Ages was the Great Schism of 1054 in which the Catholic Church was separated from the Orthodox Church. By convention, the High Middle Ages took place during the 11th, 12th and 13th centuries. It was a period of innovations with gunpowder being successfully incorporated into Asian (and shortly afterward European) warfare. In just three centuries, more discoveries were made than in the previous millennium. The Carolingian Empire was divided partly due to conflicts between East and West and more importantly because of political and military divisions caused by the two elder heirs of Louis the Stammerer. The Carolingian Empire was divided in France, Germany under the banner of the Holy Roman Empire, the Kingdom of Italy and other minor factions. A very important figure of the High Middle Ages is William the Conqueror who was crowned king of England in 1066. His rule marked the mass construction of castles that dominated warfare for the following three centuries. Before William the Conqueror's rule, Western Europe was frequently attacked by the Vikings who were eventually defeated and played a minor role in European affairs throughout the High Middle Ages. This peace and the Warm Period that lasted until the 14th century's Little Ice Age, gave room to an enormous increase in population. By the mid-13th century, many parts of Europe reached population levels surpassed only until the 19th century. While this caused many scientific discoveries and inventions, it also provided military stability which was despised by the army. An outlet for this desire of war was The Crusades - called by the pope. The Crusades caused thousands of deaths, but they also brought many innovations from the East to the West. Architecture was greatly improved and Eastern inventions that would prove useful for the Age of Exploration during the 15th century were usual. It is during this epoch when, due to increased population and decreased activities of the upper class, many new forms of literature emerged. 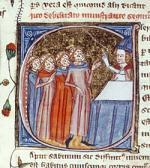 In Southern France, troubadours who sang of courtly love appeared. Dante wrote the Divine Comedy which was the period's most important poem. Folklore took a sharp twist and new stories, such as Robin Hood, were continuously revised to fit the zeitgeist. Chess was also incorporated, just as many sports and games. The High Middle Ages gave birth to many important inventions such as the astrolabe and the very first glasses. The notion that the Middle Ages, or Dark Ages as some call them, lacked art or science couldn't be further from the truth. The Late Middle Ages is a term used to describe the period of European history during the 14th and 15th centuries. In the early 14th century, the progress that characterized the High Middle Ages came to a halt. The Little Ice Age that began in the 14th century caused poor harvest and a series of famines that killed hundreds of thousands and was a probable cause of the Black Death. With the addition of many wars, such as the Hundred Years War, the population of Europe during the 14th century halved. Popular uprisings broke out across Europe, causing the Late Middle Ages to become a period characterized with poverty. During this epoch, the catholic church was greatly divided against itself. At one point, the church was led by three popes at the same time, causing great instability. The fall of Constantinople to the Turks in 1453 had a devastating effect on European intellectual and economic affairs. Europe slowly recovered. Every story, no matter how long, must eventually come to an end. The Middle Ages lasted a thousand years; from the fall of the Western Roman Empire in 476 to the fall of the Eastern Roman Empire in 1453. As you probably know by now, during all those years the world saw countless important events and discoveries that have a dramatic impact on us even now. Some call this period the "Dark Ages" because they believe that few discoveries were made during the Middle Ages which is obviously an erroneous statement. Folklore, art, medicine, science, alchemy and mathematics are just a few of the areas that were dramatically improved in the span of a thousand years. In fact, many of our beliefs come directly from the Middle Ages. Why do you celebrate Halloween? Have you ever used a compass? Have you ever gone to the doctor? Knowledge from the Middle Ages is everywhere. This is a period that we ought not to overlook as it is the most important and the one that has had the most influence in our lives. If you could mysteriously appear in XIV century England, you'd be surprised how similar most people are to you. You'd have trouble understanding Middle English and getting used to medieval customs, but for the most part their way of life was similar to ours. Many of our traditions come from that period - weddings were similar, people went to church on Sundays, kids played in the main plaza and people gathered around the castle. Cantor, Norman F. The Civilization of the Middle Ages. N.Y.: Harper Collins Publishers, 1993. Hollister, C. Warren. Medieval Europe: A Short History. Seventh edition. Toronto: McGraw-Hill, Inc., 1994.